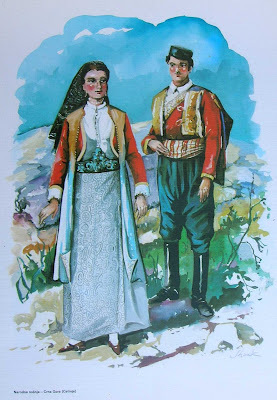 Today I will continue my article on Montenegrin costume by describing the men's costume, which, as I stated in my last article, is even more complicated than the women's. 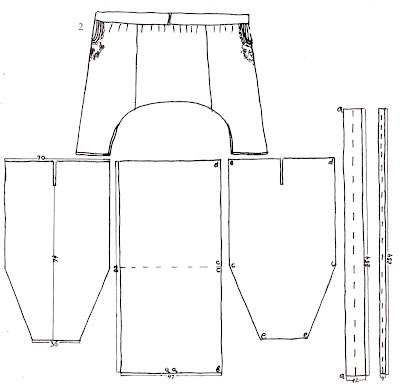 You see in the image above two versions of the men's outfit. This costume is clearly part of a complex of costumes which includes the mountains of Dalmatia, Dubrovnik and Hercegovina. 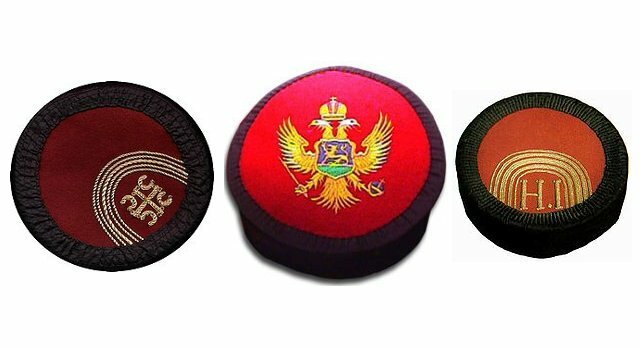 The black and red cap with patriotic gold cord-applique embroidery designs is an integral part of the Montenegrin costume and is diagnostic. 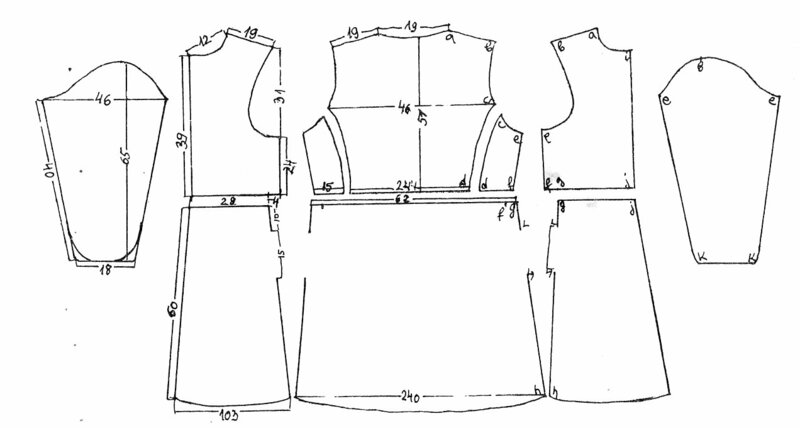 A shirt košulja of cotton or linen is the foundation garment. 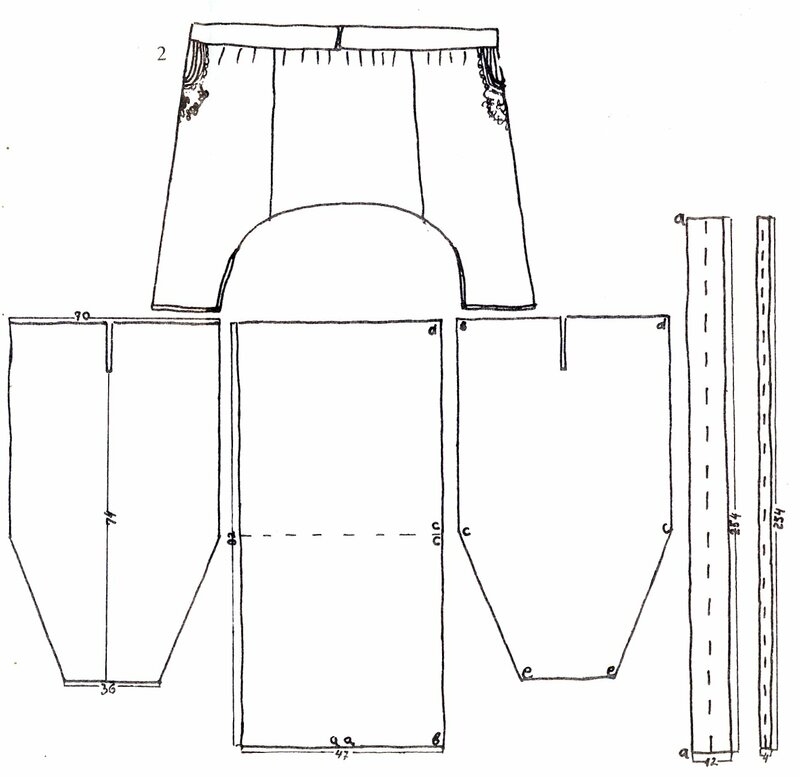 There is a stand up collar of about 2 cm, which is usually all that shows when a man is fully dressed. Occasionally, as above, a man may choose to let his shirt sleeves show, but this is unusual. Since the shirt is always fully covered, there is no embroidery. The two guys above are cheating and using store-bought shirts with fold down collars. 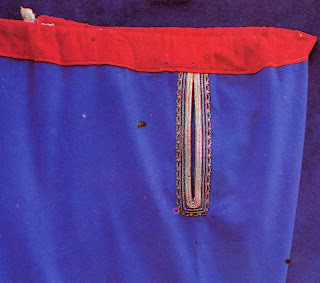 Pants dimije are blue wool, wide in the seat and narrow at the bottoms, although they do not extend much below the knees. They close on a drawstring and have gold and/or black cord applique around and sometimes below the pocket opening. 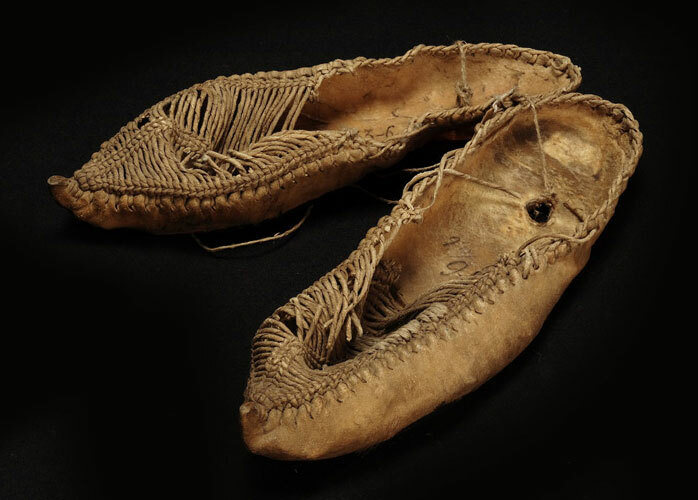 Sometimes boots are worn, as in this example, but more commonly, a series of stockings are worn with moccasins, here known as opanci. 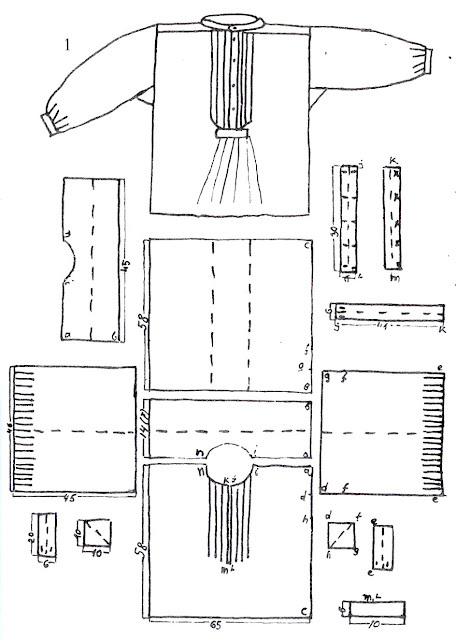 Thick white knitted stockings Čarape may be worn which extend over the calves. 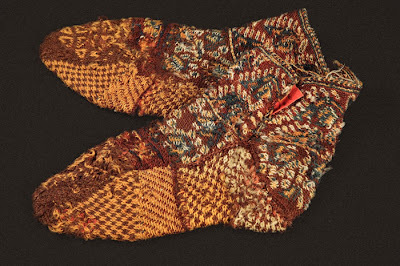 Alternatively, gaiters made of thick white woven wool may be worn. 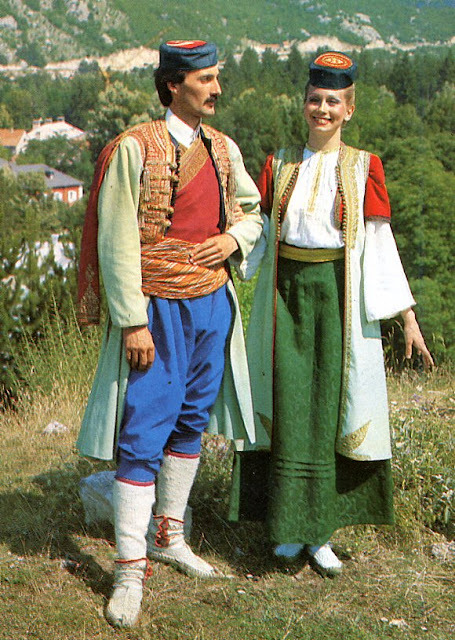 These are called dokoljenice, and should fit snugly over the calves. The raw edges are bound, and they close on a series of hooks. 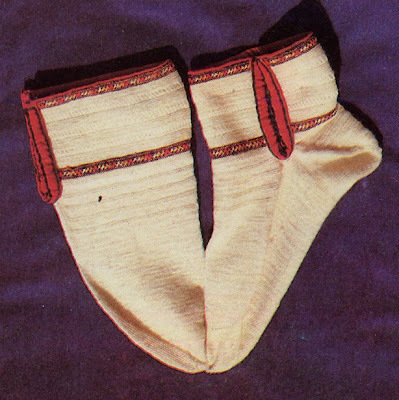 A pair of short knitted stockings, called naglavci or nazuvci are knitted of white wool with ornaments of various colors. In the past they were made of woven wool. They extend just over the ankles, and have a slit in the side which hooks closed. 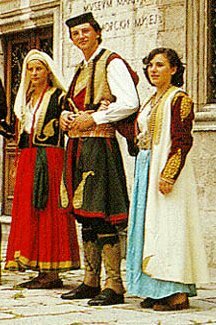 If wearing the gaiters, dokoljenice, these are essential, as they cover the foot, if wearing knitted stockings they are optional. There exists yet another type of stocking, called navršci, which cover the toes only, extending about halfway up the foot. These are typically knitted with bright designs and serve to provide a bit of color and some extra warmth to the toes and padding at the ball of the foot. Garters, podveze, are highly embroidered straps which are fastened around the leg at the tops of the stockings or gaiters, and serve the very practical function of holding them in place. They should fit snugly. 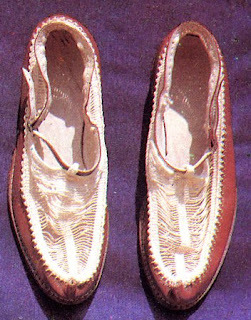 Opanci, moccasins with a small curl at the toe and uppers woven of white cord are the most traditional footwear of the region. This being such a mountainous and rocky region, such attention to the feet is understandable. Now we are fully clothed below the waist. 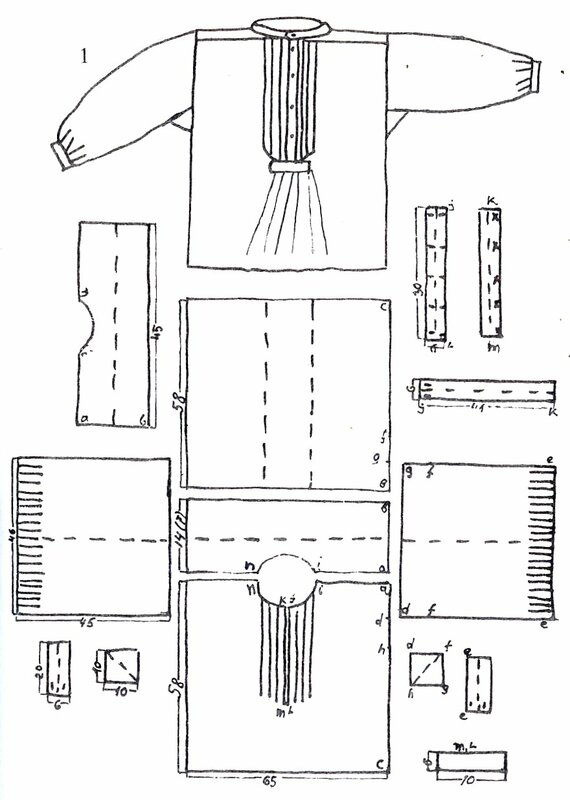 Now we must decide what to wear on the upper body. 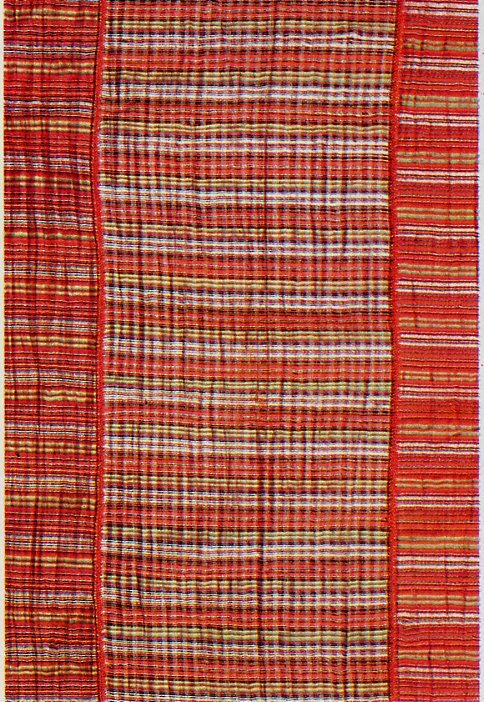 The options include džamadan, džamadan with sleeves, gunj, dolama, dušanka, jelek and jelek with toke. 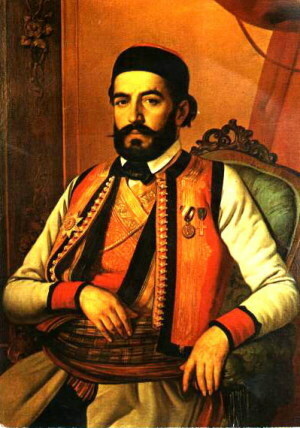 Džamadan is always put on first, over the shirt. 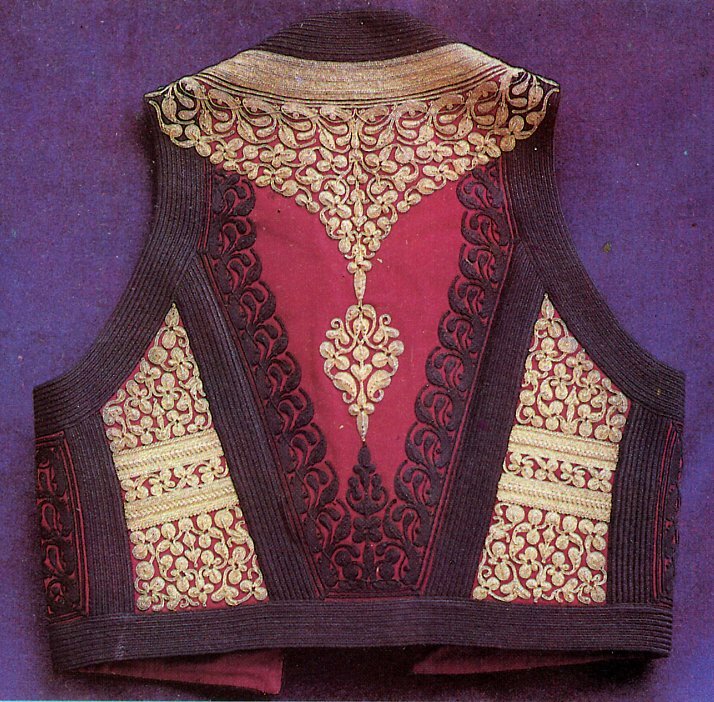 This is a double-breasted waist-length vest or jacket, usually red with scrollwork cord embroidery of black or gold at the neck and along the top of the overlap. 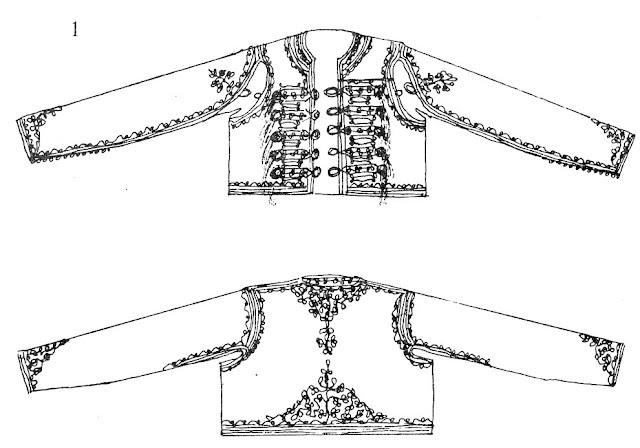 This garment is hooked closed at the sides of the torso. 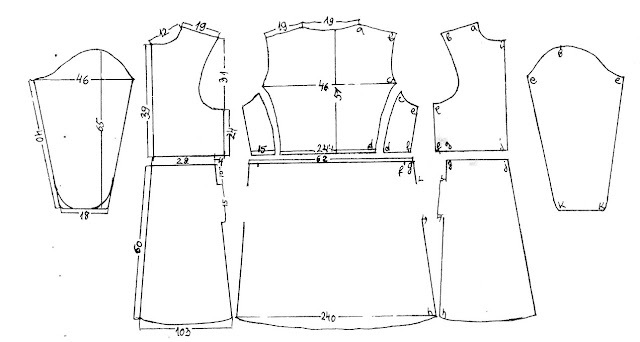 It is made with or without sleeves, the choice of which to wear being determined by what will be worn over it. If the overgarment has no sleeves, or if the overgarment sleeves will be worn loose in back, then the džamadan with sleeves will be chosen. 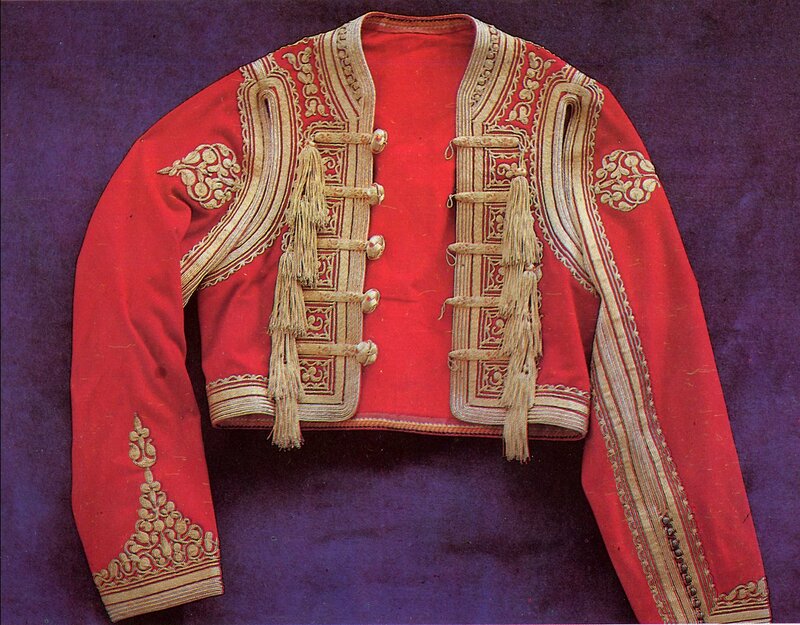 Occasionally this is the only upper garment worn, either for the sake of coolness, ease of motion or inability to as yet afford the rest of the costume. This is generally frowned upon. 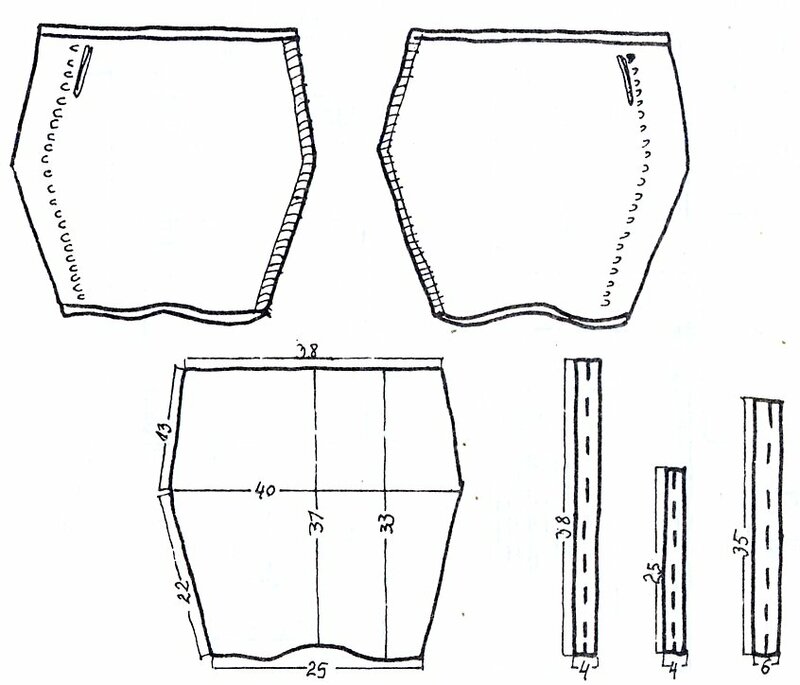 Here we have examples of the džamadan with and without sleeves. 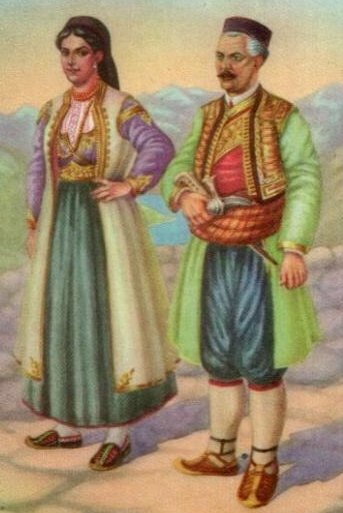 If there is a desire to wear only two upper body garments, then either the dolama or the dušanka may be worn over the džamadan. The dušanka is a short waist-length jacket which has a slit in front where the sleeves are attached, so that they may either be worn over the arms or left to hang in back. 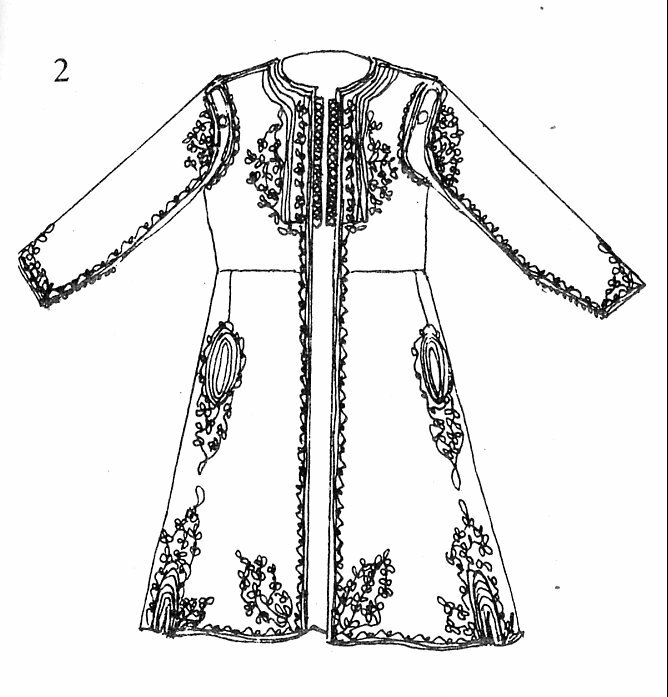 The front is decorated with braid in horizontal motifs, gold cord-applique and tassels. This, when worn, is always the topmost garment. 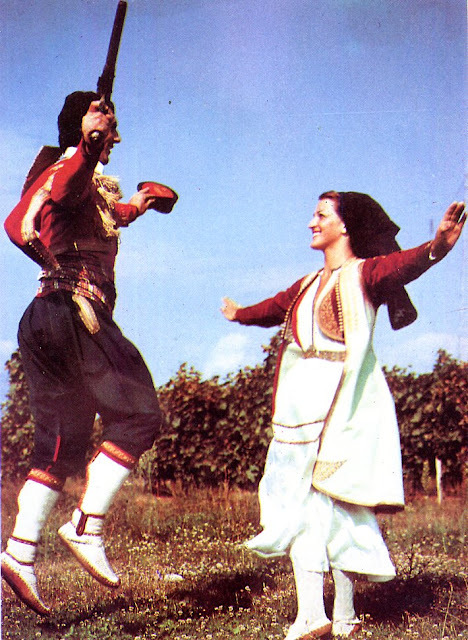 It may be difficult to see, but this man is wearing a džamadan with sleeves, and a dušanka over it with its sleeves hanging down in back. The other option is the dolama. 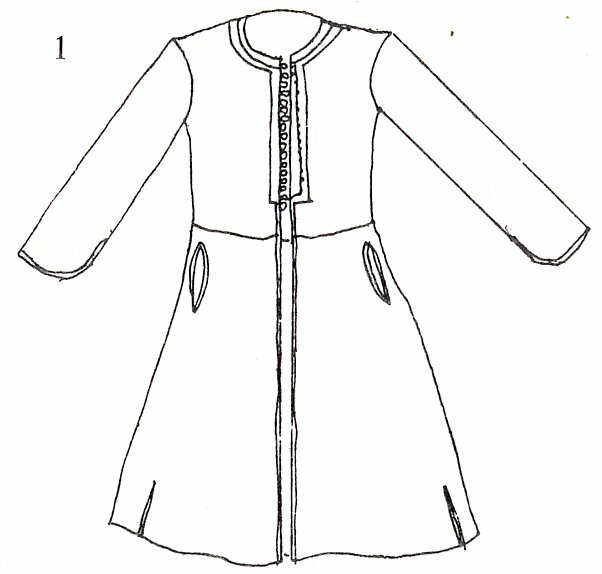 This is a knee length jacket which fits closely around the torso, but flares below the waist. 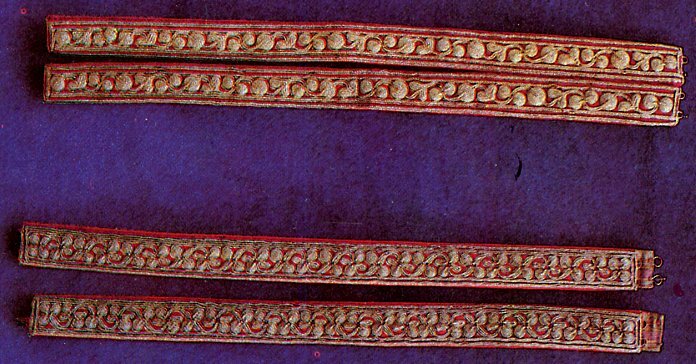 It is usually a deep green in color, and is profusely ornamented with gold cord-applique. 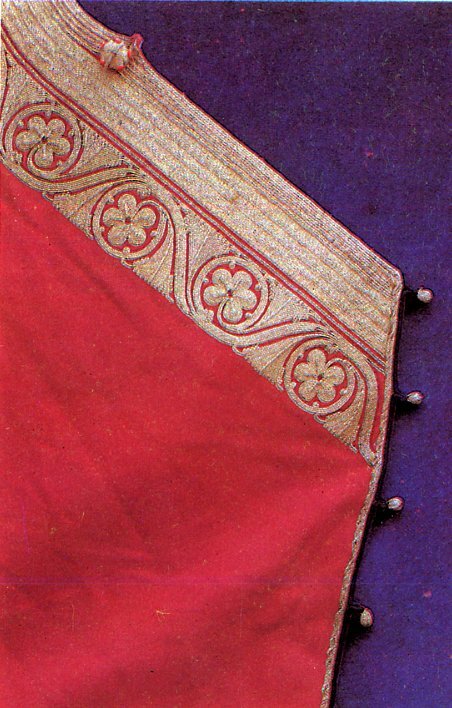 The sleeves again may be worn over the arms, or be left to hang in back, depending on whether the džamadan worn has sleeves or not. 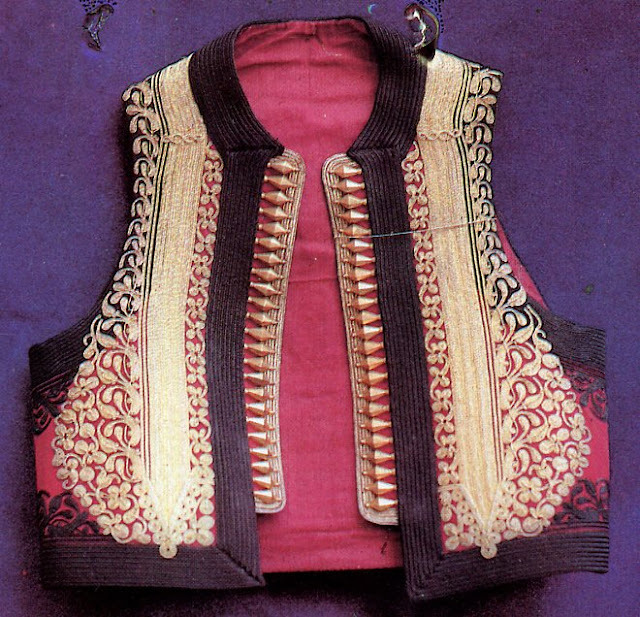 Generally there is a preference for hanging sleeves. 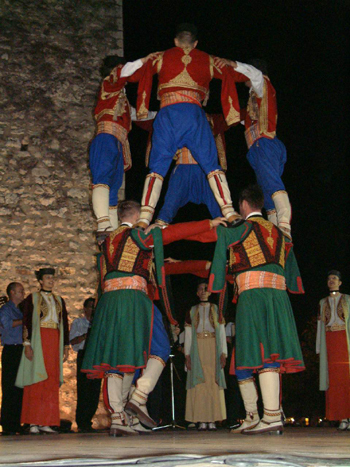 These men are wearing džamadan with sleeves and dolama with the sleeves hanging in back. This man is wearing dolama with his arms through the sleeves, and a different type of džamadan with no sleeves under it. 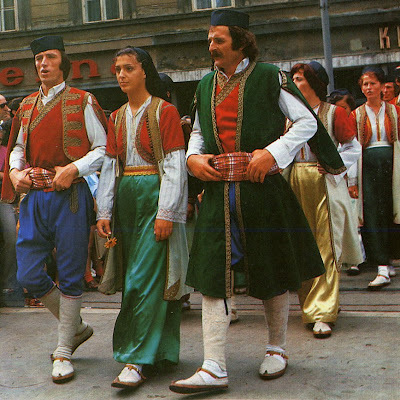 Here is a photo of a group wearing simplified stage costumes with shirt sleeves showing. 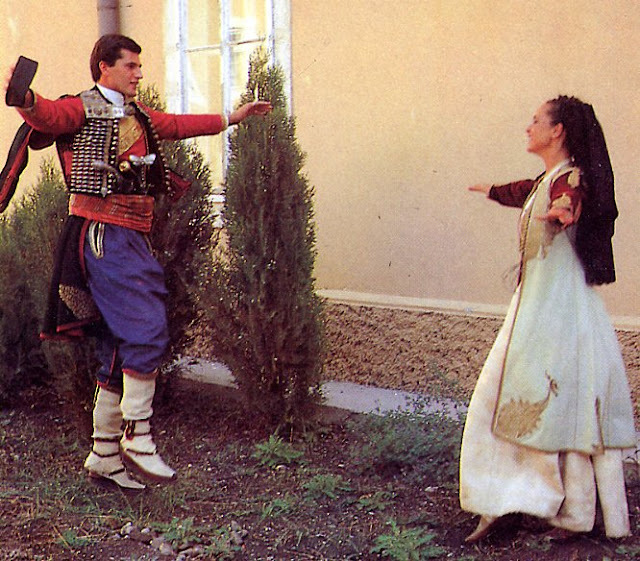 Both are wearing džamadan without sleeves. The man on the left is wearing a dušanka over it, and the man on the right wearing a dolama. The dušanka may be worn over the dolama, as in the image at the top of the article, here is a closeup. 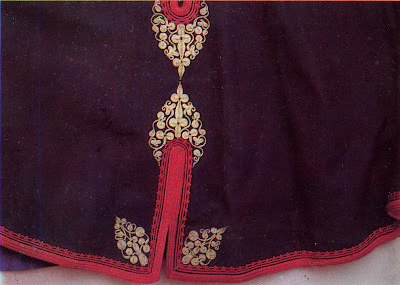 But more commonly, if there is a desire to wear a third layer, the dolama is replaced by the gunj. 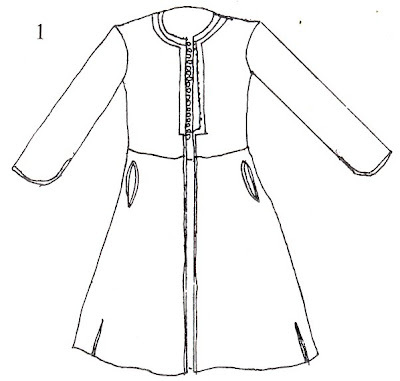 The gunj is very similar, but made of an ivory or light green color, very little ornament, except for the fake buttons on the front, and the sleeves are sewn in all the way around, and so the arms must be worn in them. The gunj is never worn as the topmost garment. 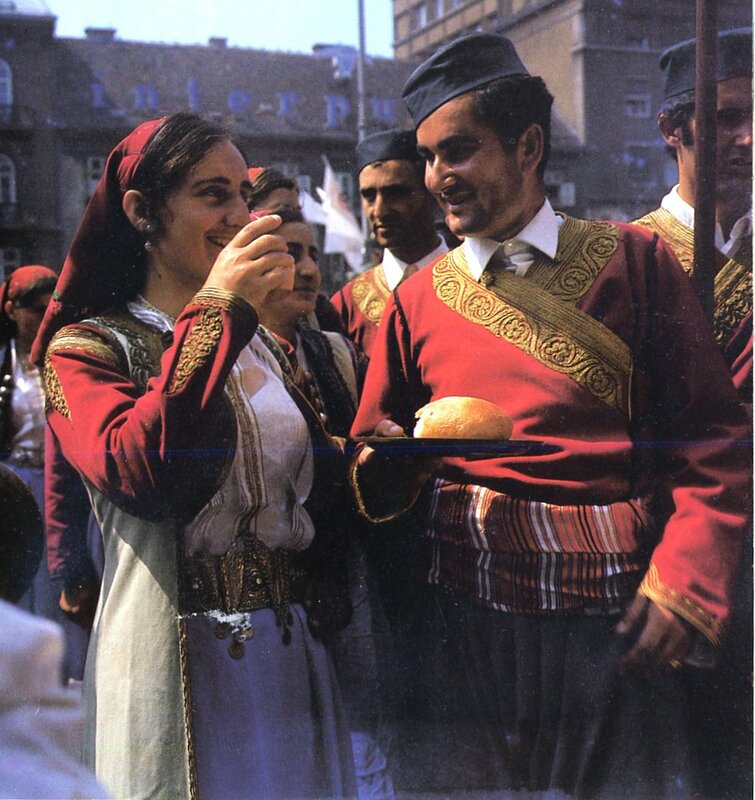 Here are a couple of men wearing sleeveless džamadan, gunj and dušanka. 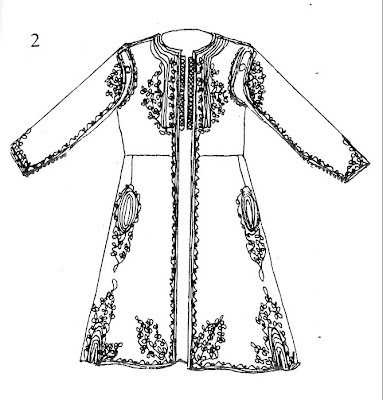 The other option for the topmost layer is the jelek. 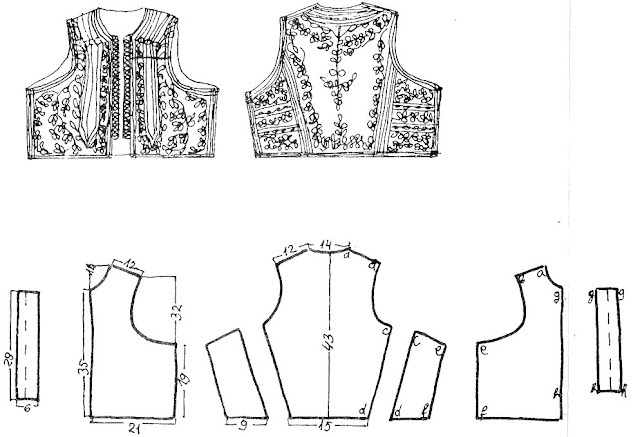 This is a waist-length vest which is richly ornamented all over, including the back. 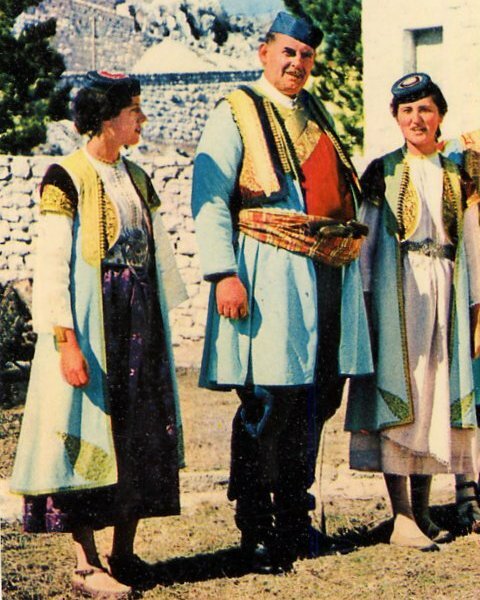 Here are some images of men wearing sleeveless džamadan, gunj and jelek. 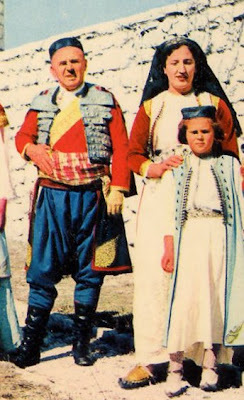 Here is an image of a man wearing sleeveless džamadan, then dolama, and a jelek on top. The last variation [I promise] is jelek with toke. 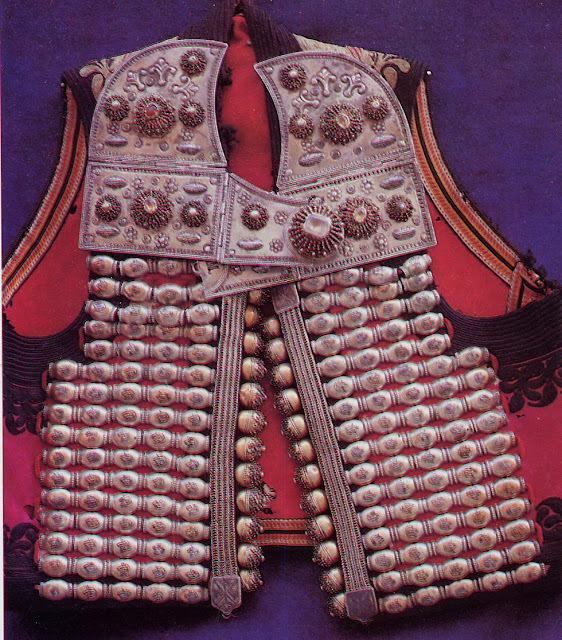 Toke are large silver plates which may be attached to the front of the jelek. 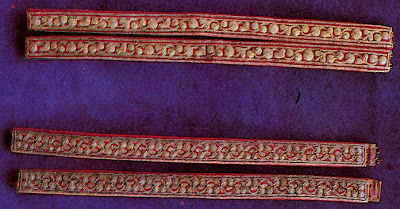 This is very expensive, so only clan chiefs and other important individuals were able to wear these. Here is an image of jelek with toke. Here are a couple of men wearing džamadan with sleeves, dolama, and jelek with toke. 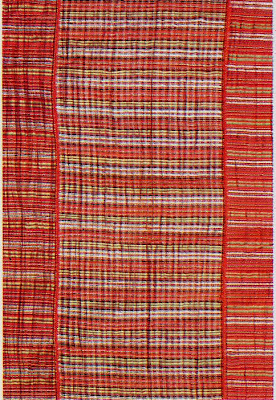 A wide long sash made of silk plaid material is tied over the waist, on the outside of the gunj or dolama when worn. The trombolos is traditionally made of three widths of silk, 5m by .3 m. Here is an example. The silav, a wide leather belt with pockets in front for holding arms, is traditionally an integral part of this costume, as in former times a man would never venture into public unarmed. See the various images in this article. 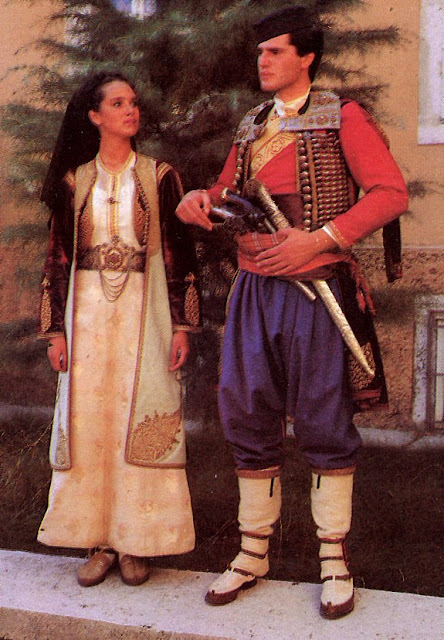 Thank you for reading, you now should all be experts on the various permutations of the men's Montenegrin costume. This should help you catch mistakes, such as this one. This points out the danger of relying on artist's renditions. 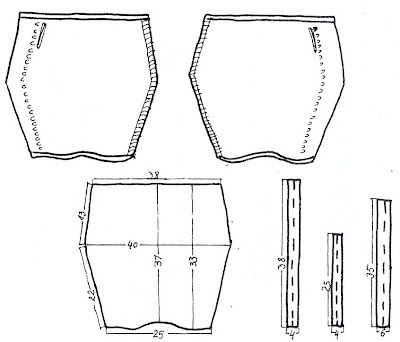 Here is a plate by the famous Vladimir Kirin. 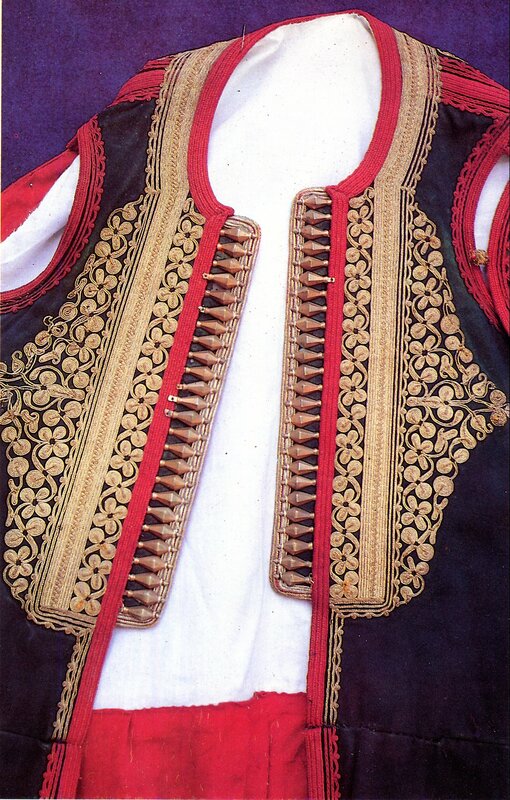 This man is wearing a sleeveless džamadan with black cord applique, a gunj, and jelek with toke. The artist, however, has added dolama sleeves hanging in back, without any dolama for them to be attached to!? It seems to me that artistic license only extends so far. 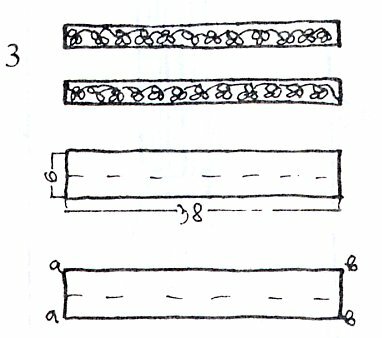 See if you can identify the various combinations in the images below. 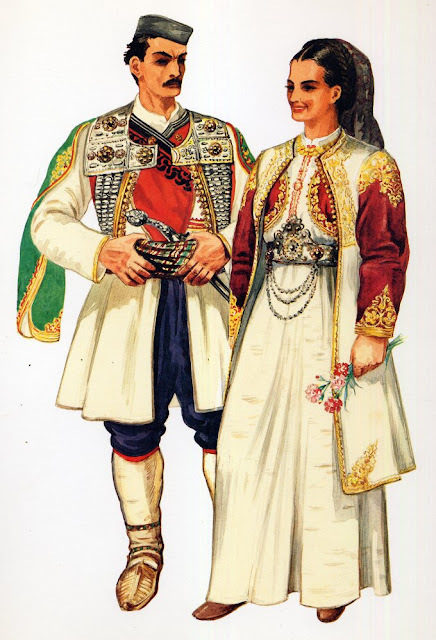 Here is a website showing beautiful closeups of various pieces of the Montenegrin costume. I believe you might be able to order them here as well. 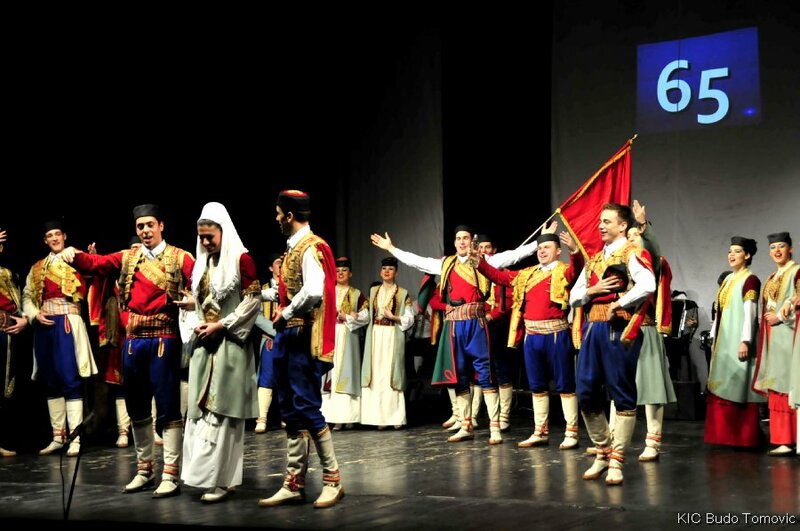 Here is a stage performance of traditional dances and songs from Montenegro. 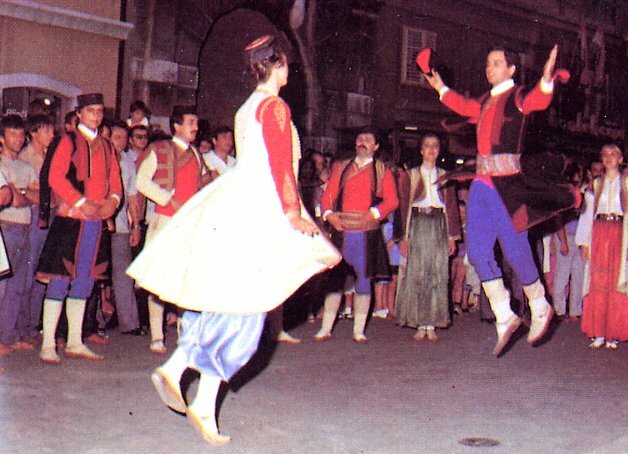 Including the famous Eagle Dance. The costumes are simpler. 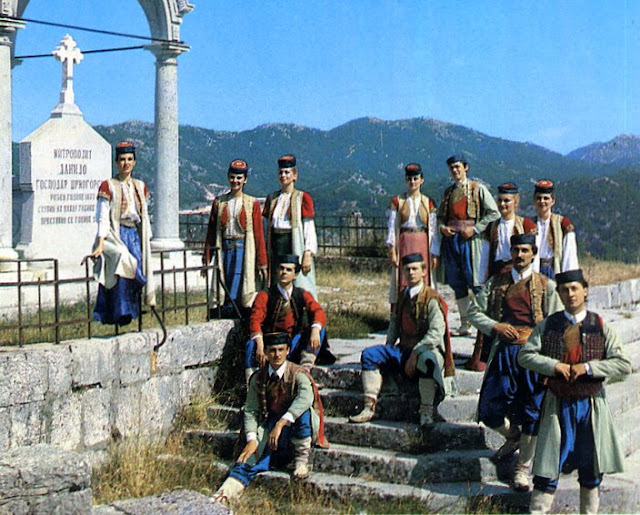 Here is a slide show showing scenes from around Montenegro, and playing some popular songs from there. I’m delighted upon seeing your work of art. The details are quite complicated but I’ve learned a lot from your post. 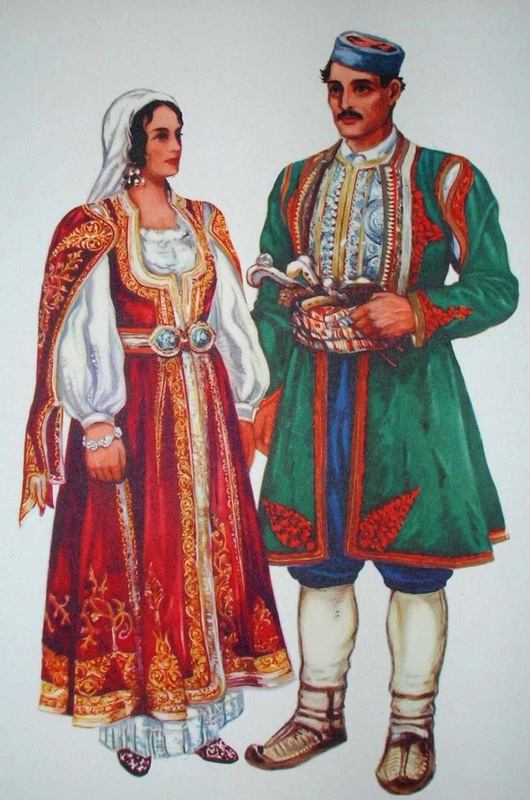 I’ll be dedicating myself into creating costumes like these; maybe my 3 years in Kostüme Kinder creation would be a great help in my next endeavor. Folk dance is really good dance for all and they very old dancing and that costumes are really nice to looking and mostly to doing with dance. 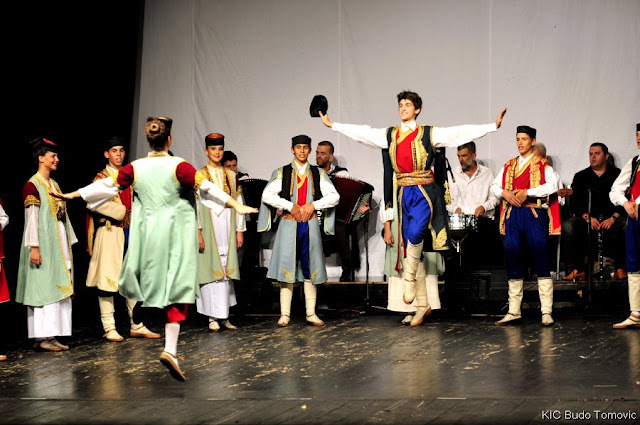 So you can giving better information about folk dance and clothing also. 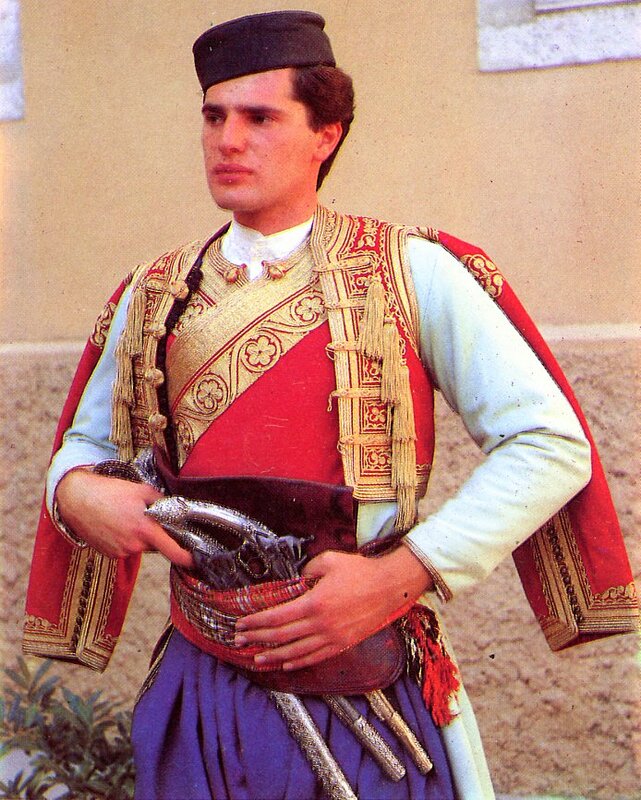 This national costume is little complicate to understand but is most beautiful, thanks! Hvala vama puno na detaljnom objasnjenju! 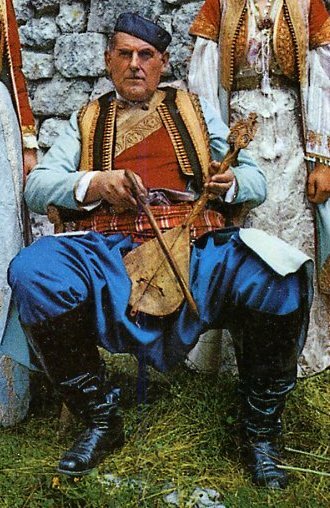 Sada znam, u cemu je razlika izmedju dusanke, dolame i gunja!